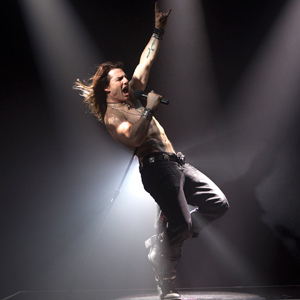 Tom Cruise’s character, Stacee Jazz, has elements of real-life rockers Axl Rose, Keith Richards and Bret Michaels. "You’ve never seen or heard Tom Cruise like this before. "In New Line Cinema’s Rock of Ages, next year’s big-screen adaptation of the hit Broadway jukebox musical that celebrates the ’80s heyday of power ballads and glam metal, Cruise transforms into Stacee Jaxx, a superstar devotee of hair-band excess. "His character has elements of Axl Rose, Keith Richards and Bret Michaels," says director Adam Shankman. "We did a huge amount of research on what people were going through in this period." He also relied on personal experience. "I knew a lot of these people because my dad was a music business manager." "It was Cruise, a fan of Shankman’s version of Hairspray with John Travolta, who first approached him with the idea of doing a movie musical together. One problem: "But I couldn’t think of what musical would work with him," the director says. But after seeing Cruise dance with wife Katie Holmes as she sang "Whatever Lola Wants" at a charity event last year and pull off his comedy shtick as obnoxious producer Les Grossman in Tropic Thunder and on MTV, Shankman was convinced he might be right for the Rock of Ages front man. "I thought, who better to play the biggest rock god in the world but the biggest movie star in the world?" Just to make sure, the actor’s vocal chops were put to the test after some coaching. Turns out, "He has a huge voice." "Just as Shankman adjusted Hairspray when it went from stage to screen, so, too, has Rock of Ages undergone a makeover. "It is the exact same spirit. But the tone on Broadway was campier, which makes it difficult to connect to the characters. We raise the emotional stakes. We had to give it some weight." "That includes changing Jaxx from less of a predatory snake to more of a lost boy. "We made him what these guys are, man children," Shankman says. "Someone no one says no to. More of an innocent who does something wrong and doesn’t know it." "While Cruise gets to belt out classics of the era such as Bon Jovi’s "Wanted Dead or Alive," Scorpions’ "Rock You Like a Hurricane" and joins in a group performance of Journey’s "Don’t Stop Believin’," he also tackles a fair share of fancy footwork choreographed by Mia Michaels of TV’s "So You Think You Can Dance." "Says Shankman, "Does Tom dance? Let me put it this way. He is dancing so much, we are all exhausted and laying down on the floor. He is dancing us into the ground. I’ve never seen someone who wants to rehearse more."